HEAT oven to 350°F. Spray a baking sheet with no-stick cooking spray. Spray both sides of wonton wrappers with no-stick cooking spray; slice into 1/4-inch strips. PLACE strips on prepared sheet; bake just until lightly browned, about 5 minutes. Set aside. BRING chicken broth, water, soy sauce, ginger and garlic to a boil in a 2-quart heavy saucepan. Remove ginger and garlic with a slotted spoon and discard. STIR in noodles; simmer, uncovered, until tender, about 4 minutes. Stirring soup in a circular motion, add eggs in a slow, steady stream. Simmer, undisturbed, until strands of egg are cooked, about 1 minute. REMOVE from heat; stir in most of the green onions (reserve some for garnish) and sesame oil. Season with salt. 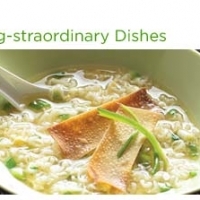 Ladle soup into serving bowls: garnish with wonton strips and reserved green onion slices. Serve.